So, I realized that, as far behind as I was, if I tried to write individual posts for these episodes I would never ever ever catch up. I’m also not sure I could really make full episode posts out of each of these episode (14, I could have, I think), so it’s nice to be able to just focus on a few moments from each and then move on to the next one. In any case, we’ll be back on schedule next week. Woo! Following up the power of the Blue Dragon’s backstory was never going to be easy, but Yona’s confrontation with the Blue Dragon in his cave carried a lot of power all on its own. Here, we see Yona at her most fearless, because she is at her most certain. Having met Ki-ja and having felt the warmth of the Blue Dragon’s hand, his sword seemingly means nothing to her. It is not a threat, only an expression of his pain. But I do very much appreciate that the Blue Dragon refuses to go with Yona at their first meeting, and that she accepts, at least for that moment, his decision. Yona seems to understand instinctively that she cannot bully and she cannot force these people to bend to her will—she can only convince them through the strength of her conviction. The other big moment in this episode, as always, was one of Hak’s non-trolling moments, as he desperately tears at the cave in with his bare hands, drawing blood without regard to his own safety or health. What’s even more powerful is to see him beg the deceased King Il not to take Yona from him, to preserve his duty and his orders. It’s a moment deeply revealing of Hak’s potentially conflicting reasons for protecting Yona—is she the girl he loves, or is she the daughter of the king he served? Can she be both to him? And what are the implications for him with either or both of those? Hak has chosen a hard path; in a lot of ways, he reminds me of Chihayafuru‘s Taichi, always taking the most difficult route because that’s where his heart leads him. 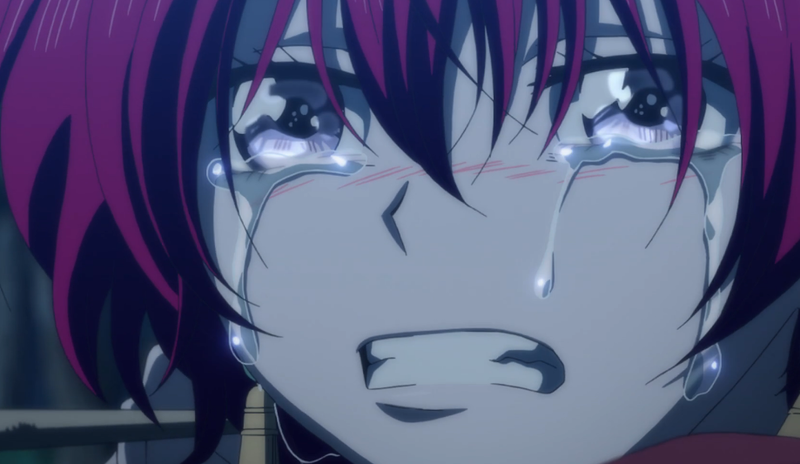 Well, that was a knockout episode from Akatsuki no Yona in an arc that’s been full of them. The Blue Dragon has probably been the most sympathetic character we’ve yet met—although sometimes I feel Hak approaches Taichi-level suffering in his relationship with Yona—and pretty much all of Yona’s interactions with him are heartwarmingly generous on the show’s part. I talked a lot in my earlier posts about how I thought one of Yona’s defining goals was her desire to understand other people on their own terms and to do it better. We get a lot of that in this episode, of her generosity of spirit, and not only with the Blue Dragon. Yona’s line about the villagers, “I’m glad they aren’t people who would abandon their families,” I think, speaks to a deep grace that Yona has chosen to show to everyone she encounters, whether they be friend or foe. This could very well end up being a weakness for her—indeed, I expect that it will—but I think it’s better to trust and regret, rather that reverse (10 points to anyone who knows what anime I’m referencing there). But we don’t just get generous Yona this episode. We also get a chance to see driven, demanding, and selfish Yona—the necessary counterpart that allows her to be so good to others. Except Hak. Poor, poor Hak. No matter how beautiful the moments with the Blue Dragon were, including Yona’s naming of him (such a hugely important scene), the headliner this episode was Yona’s brief encounter with Hak at the lakeside. Her two commands to him: “Call me Princess. Remember my father and his daughter.” Despite how often Yona reiterates that she wants to eventually protect Hak, she still has to lean on him right now. And this request asks Hak to deny his own feelings for the sake of his duty. What a brutal distinction for him to have to make, when the two have more or less been in sync this entire time. That moment floored me. It was amazingly tough to watch, and yet Hak kneels before his princess and tells her that it was King Il he prayed to in the tunnels. Man. But, of course, if all you saw in this episode was a cheery diversion from the “serious” plot, you’re missing practically everything of importance. Soo-won isn’t at the Earth Tribe capital to sightsee and he certainly isn’t there to play games. He’s there to find out who is truly loyal to him, whose loyalty he can gain, and how he can get it. We have the privilege of knowing what Guen-tea does not: that Soo-won is willing to do anything he needs to in order to achieve his goals. Masked by a deceptively naive disposition, Soo-won has discovered a powerful weapon in the form of the Earth Tribe’s leader and an even stronger one in the form of the Earth Tribe’s love of Guen-tea. When Guen-tea inevitably rides into battle at Soo-won’s command, his entire tribe will follow him. And still, Yona must come to terms with the fact that avenging her father means violating everything he taught her. I’m still behind myself but oooooooh, so they bumped up Soo Won’s earth tribe adventure? Interesting, won’t affect the plot (I mean, manga compared to anime) but IIRC that came a little later, curious why they did it though….. It was following the scene where Yona meets the sick guy in the streets and he tells her the practical implications of King Il’s rulership on the common people. I thought switching to Soo Won after that was a really effective juxtaposition to emphasize the differences between the two kings. Which is ironically undercut by the constant stream of Guen-tea going, “He’s just like King Il,” when we know Soo Won is very different than the old king. I admit I’m one of those people who didn’t like episode 15 as much as the last few episodes that preceded it… but that said, it’s probably only because those handful of episodes were by far the most emotionally compelling of the series to date for me. 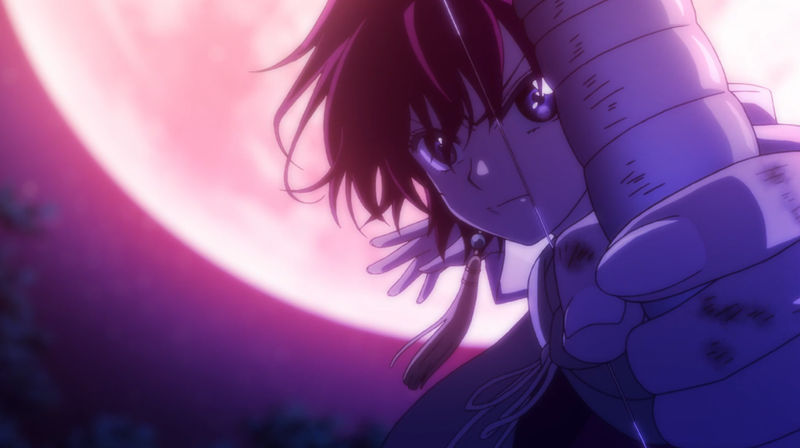 That said, I don’t think there’s anything wrong with taking a bit of a breather – I’d hate to see Akatsuki no Yona rush through it’s following story arcs after all, especially since I assume the tension will be continuing to build up as the team grows closer to completion and something of an endgame comes into sight. And hey, new OP and ED themes! What are your thoughts on those? To be fair, I do think, on its own, episode 15 was somewhat dull and felt a little pointless, but I really appreciated the irony of it being so when we know it was anything but. OP: I actually like the song quite a bit, but I think it’s extremely ill-matched to the show, especially when considering the animation sequence contains a lot of the same visuals. It’s like constantly being reminded that the first OP was perfect for Akatsuki no Yona. ED: I don’t really have much of an opinion on it. It’s nice, I guess? I’ll probably have to hear it a few more times before I decide—I do like the new visuals, though. I think they’re better than the visuals for the first ED. Yeah, I too quite like the new OP song but it seems really unsuited to the actual show. And I don’t like the ED song as much, but I still almost wish it had been the theme song used for the OP instead just because I think it fits the show so much better. Yeah, I agree. Episode 15 was just weird and somewhat pointless. I did feel that it stretched out longer than it needed to. All of the gags were nice, but it’s different when they’re with characters we haven’t already grown attached to. I guess I shouldn’t be surprised that there are complaints about the pace at which this story unfolds, but I absolutely love the measured pace. There are plenty of battle of the week shows out there. Yona is more than that. Yeah, I feel like I keep hearing, “WHY AREN’T THEY KILLING THINGS YET!” And, yes, I realize that Yona teased us with the endgame at the beginning, but I feel like people have made a much bigger deal out of it than necessary. Heh, you may be very right. All hail Shirobako and its perpetual relevance to basically everything! I actually liked Episode 15. I liked the musings on what it meant to be a good king. I like that Yona has to come to terms with the implication that King Il may have been a good man, but a bad king. I haven’t read the manga, but my theory is that the other kingdoms pressured King Il into assassinating his brother, Soo-Won’s father, in exchange for peace. That would make Soo-Won’s grievance legitimate, and may even justify his actions. Great point; I forgot to mention this in the post, but I really appreciated how they structurally juxtaposed Yona’s experience with the man in the streets with Soo-Won’s trip to the Earth Tribe. What anime is that reference from?! I’m very curious! Soo-won is one sly guy alright. During the whole Soo-won in Earth Tribe scenes I was going “OK, now he’s gonna reveal how wrong Guen-Tea’s impression of him is.” But the show goes “Nope, not yet.” Then we hear about the ‘war’ intention from Soo-won and I thought “Ha! Finally!” Then the show throw us back on our seats with the supposedly ‘war games’. I think someone with less patience than Soo-won would have already shown his hands and cards. But no, Soo-won is just too cunning for that. Your interpretation of Soo-won’s actions illuminates the reasons behind his acts. A test of loyalty of the general and the followers is not something I thought of at first.